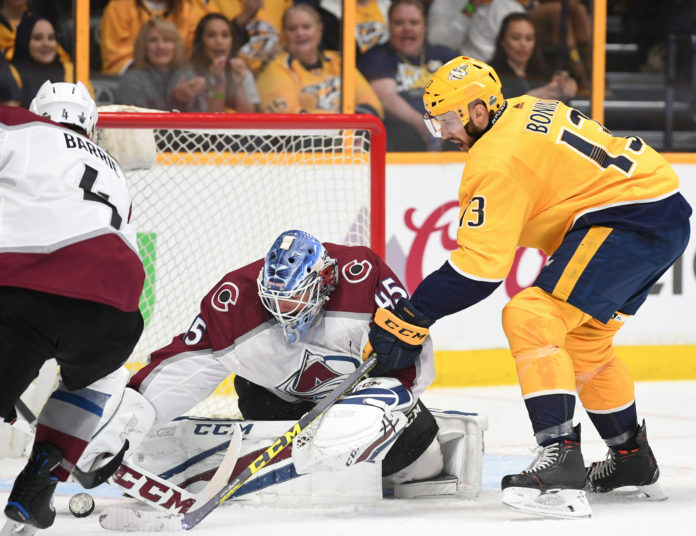 The Colorado Avalanche were turned away from bringing home a tied series against the top-seeded Nashville Predators after their 5-4 loss in Nashville on Saturday. It was Déjà vu in the first period for Colorado. Just as they did in game one of the series, Colorado scored on their first shot-on-goal after a blast from former Nashville Predator Gabriel Bourque found the back of the net. Colorado defensemen Tyson Barrie would take big hit in the period — his second in as many games — and leave the ice, but would later return. Already short-handed after a late-scratch kept Sam Girard out of the game. Colorado hung tough and the score would remain 1-0 into the second period when Nashville began to take control of the game. A power-play goal from Kevin Fiala would tie the game and later in the period, Victor Arvidsson would rocket a slap-shot past Jonathan Bernier for the Predators first lead. After Mark Barberio and Austin Watson were called for minors later in the period, the Predators were not done as Ryan Johansen would score his 10th career playoff goal inside the four-on-four hockey play on a breakaway back-hand moving to his left that beat Bernier to make it 3-1. But then the Avalanche answered and their Hart Trophy candidate Nathan MacKinnon took the call. MacKinnon bullied skaters draped all over him in the neutral zone, flew down the ice and back-handed a shot past Nashville goalie Pekka Rinne before he could get set to cut the deficit to 3-2. In the final minute of the second period in-front of the Nashville net, Rinne shoved Matt Nieto, who retaliates after and was called for roughing, allowing the Predators to start the third period on a power-play. The Predators fourth of the game. With both teams tied at 19 shots going into the final period, the Predators would spend the first 1:55 on the advantage. The Predators would get four-shots on goal in the power-play after the Avalanche whiffed on a couple clearing attempts, but a big penalty kill allowed the Avalanche to build moment. After a tripping penalty was called on Subban, the Avalanche pounded at Rinne early in the third period, but couldn’t get one home and the Predators would later, make the Avlanche pay on sloppy play. 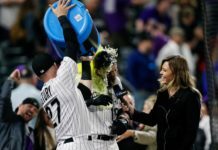 After attempting to make a line change, there was an awkward moment when the Avalanche failed to field a puck in the neutral zone, attempting to avoid too many men on the ice. The puck passed hit the board and Predator sharpshooter Austin Watson took it directly at Bernier, scoring over Bernier’s shoulder glove-side for the 4-2 lead. It was Watson’s second goal in as many games and his sixth career playoff goal. Colorado would get a critical shot to cut the Nashville lead in half and they took advantage. 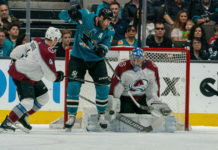 With a 5-on-3 man advantage in the third period, MacKinnon fired a shot towards the net that was tipped twice on the way by the stick of Gabriel Landeskog. MacKinnon would finish the game with an Avalanche game-high six shots on goal, also finishing with a goal and an assist. With 2:00 left in the game. Bernier would leave the net, bringing on the extra skater for Colorado. 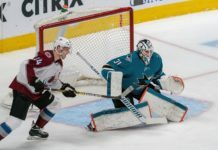 Tyson Barrie would have a slap-shot from the point denied and after a clear from the Predators, Ryan Hartman beat the Avalanche down the ice, negating the icing and scoring on the empty-netter. The Avalanche would quickly get right back into it, as Bernier skated for the bench and Alexander Kerfoot beat Rinne with 35 seconds left. Colorado however could not get out of their own zone in the final couple seconds, as Nashville sealed the win and a 2-0 series lead. Colorado’s Daniel Warsofsky would finish with a Colorado high +2, while Nashville’s Mattias Ekholm and Subban would finish with a game-high +3. The series now shifts to Colorado as the Avalanche play host to the Predators on Monday night at Pepsi Center in Denver. Puck drops 8pm MST.